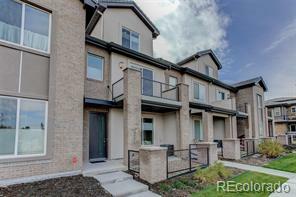 Wonderful like-new townhome in Greenwood Village in the DTC with less than a 5 minute walk to Arapahoe Station Light Rail. Built in 2016, this home has hardwood floors throughout main level, custom cabinetry throughout, stainless appliances and granite slab countertops in kitchen and all baths. Custom Hunter Douglas blinds. The kitchen has a 4 burner gas cooktop and decorative backsplash. All the closets have custom built-ins. This home has 4 bedrooms and 3-1/2 baths, with the 4th bedroom and 3/4 bath on its own top level. There are 3 decks as well as a front covered patio that overlooks open space. The home has been beautifully maintained and shows immaculate. There is a modern built-in flush electric fireplace in the great room and the TV and mount are included. Two car attached garage with private driveway which allows for two additional parking spaces. There are many Greenwood Village trails close by in the area for walking and/or biking. in The Cherry Creek School District.